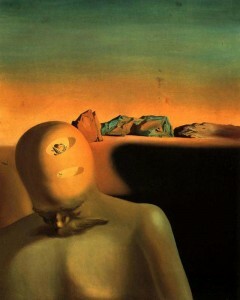 Average Bureaucrats (2011) was inspired by the eponymous painting by Salvador Dalí, which depicts a bent, defeated figure in a deserted landscape peppered with odd, seemingly unrelated objects. The music, in turn, reflects this depiction as small motives and patterns are presented as random objects surrounding a barren textural plain. As its title implies, this piece also explores the fruitless labors of navigating a massive, unrelenting bureaucracy, much like those depicted in Kafka’s das Schloss (The Castle) and Terry Gilliam’s Brazil. In these works, the bleak and sinister reality of a labyrinthine social structure is masked by a seemingly benign indifference that seems to inevitably lead to madness or death, always preferring euphemisms and meaningless adjectives to describe objects that may reveal the hideous face of an arbitrary dictatorship.